DIY – How to Make a Baseball and Softball Keychain « Sports Roses. Your passion for sports…expressed. 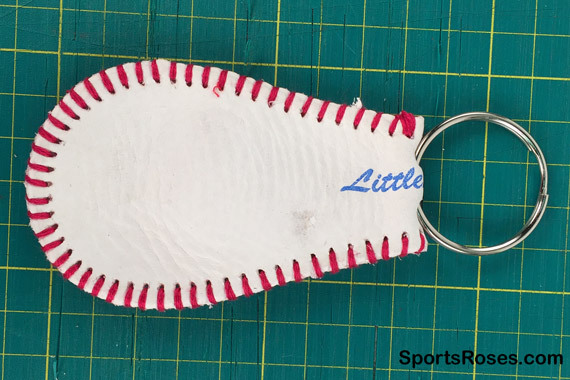 In this week’s DIY tutorial, I will show you how to make a stylish and durable keychain out of a real baseball or softball. This craft is easy to moderate in difficulty and will take you about 1 hour to complete your first time. 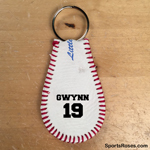 I make and sell these Baseball Keychains in the Sports Roses online store here. 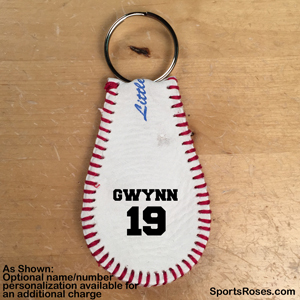 My handmade Baseball Keychains can be personalized with a player name and number imprinted on the leather. Use a box cutter to cut the stitches along the seam of the baseball. Be careful not to cut the baseball leather or your fingers. Carefully pry up the leather at the seam and remove from the ball core. Don’t force this step because it can cause one of the stitch holes to break. 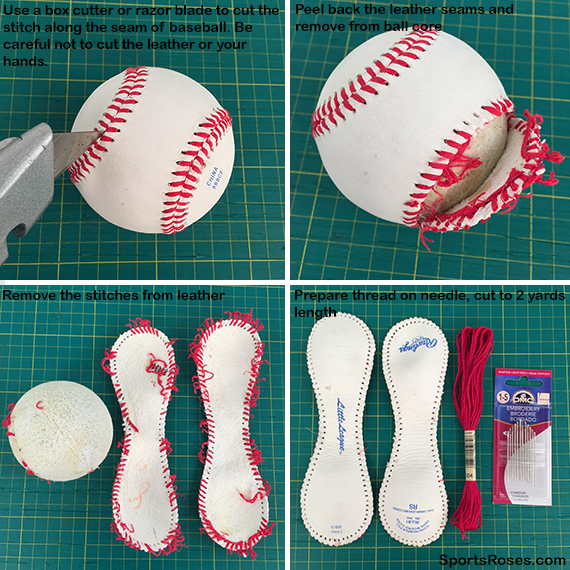 You may need to retrace the path a second time with the box cutter if you have difficulty separating the leather from the ball. Once the leather halves are off the ball, remove the existing red string. 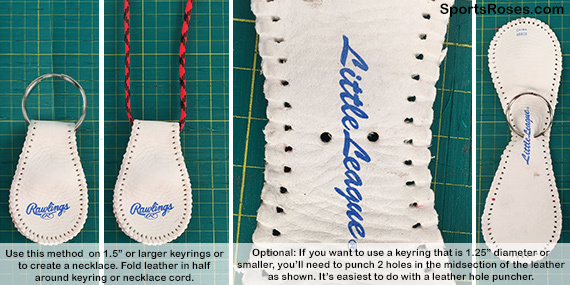 For keyrings that are at least 1.5″ in diameter and using baseball leather, insert the leather through the keyring and fold the leather in half. When making a keychain using larger softball leather or keyrings that are 1.25″ or smaller, you will need to punch two holes at the mid section of your ball leather and thread the keyring through the 2 holes. Cut a 2 yard length of red embroidery floss and thread onto the needle. 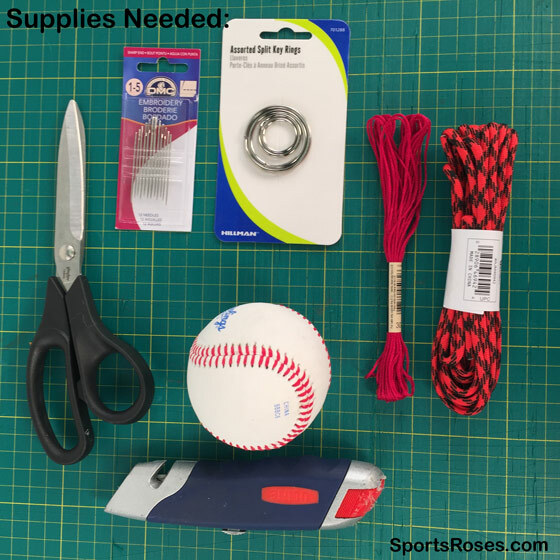 Tie the end of the thread opposite the needle to the hole at the midsection of the baseball/softball leather closest to the keyring. Repeat to create a strong knot. Fold the two halves of the leather together, making sure the holes on each half line up. Choose a side of the leather to be the front when you hold it. 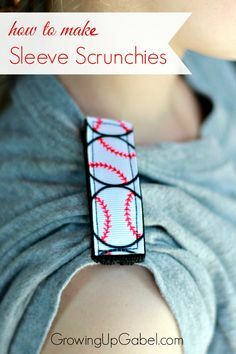 Bring the needle & thread from the front side, around the seam on the edge, and insert the needle into the matching whole on the back side of the leather. Position the needle in a downward angle to find the next unthreaded hole on the front side and bring the needle through. Pull the needle and thread tight. Repeat threading each hole until you reach the last hole on the other side of the keychain. Tie a knot around the final hole. Repeat the knot 2 more times to make sure it is secure then cut off the excess thread (leaving about 1/2″-1″). Use the eye of the needle to tuck the excess thread in between the too leather halves to conceal it. Add your keys and enjoy your new keychain. You can also make a pendant necklace using these steps except add a chain or cord instead of a keyring. 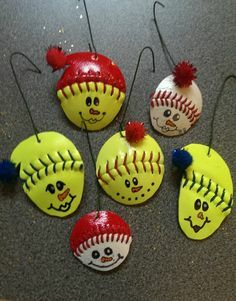 Another creative twist on this idea is to use colored balls or photo balls to make your keychain unique. 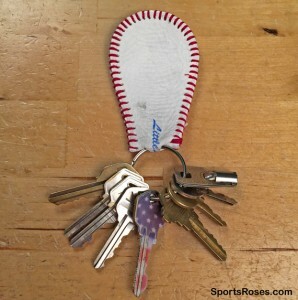 Don’t have time to make your own baseball keychain? I can make one for you. Order online here. 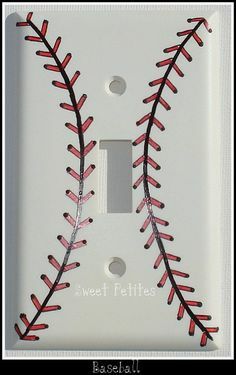 I can also personalize it with a player name and number.